The large warehouses in this area, stacked with combustible materials, were always vulnerable to fire. Hay's Wharf was one of the earliest complexes to incorporate fireproofing, using incombustible floors of brick arches on cast iron beams. 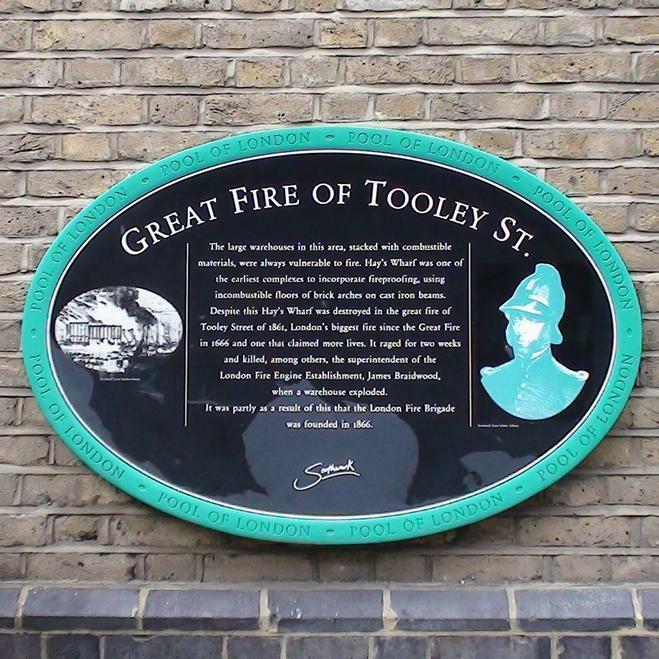 Despite this Hay's Wharf was destroyed in the great fire of Tooley Street of 1861, London's biggest fire since the Great Fire in 1666 and one that claimed more lives. It raged for two weeks and killed, among others, the superintendent of the London Fire Engine Establishment, James Braidwood, when a warehouse exploded. It was partly as a result of this that the London Fire Brigade was founded in 1866.